Some call it a bodybuilding staple. Others say it doesn't live up to the hype. Use our expert guide to see what glutamine means for you! If your body was a country club for supplements, you'd see glutamine everywhere: chilling by the pool, hobnobbing with directors, and playing entirely too much tennis. As the most abundant amino acid in the body, glutamine can be found in muscle tissue, plasma, and in nearly every animal product you ingest. On average, it constitutes a little more than five percent of the amino acids found in animal-derived protein sources such as meats, dairy products, and eggs. That may not sound like much, but make no doubt: Glutamine is critically important to a wide range of bodily processes. Something this important has to be an "essential" acid, right? Not exactly. Glutamine is considered "conditionally essential." This means your body can produce enough to meet its needs under normal circumstances, but not always. In other words, you need to consume dietary sources of glutamine under certain circumstances when your body is under extreme duress. As a supplement, glutamine has plenty of die-hard fans. It also has detractors who say that unless you are a recovering burn patient, this amino is best left on the shelf. I'm here to sort through the research and help you decide if glutamine is right for you. 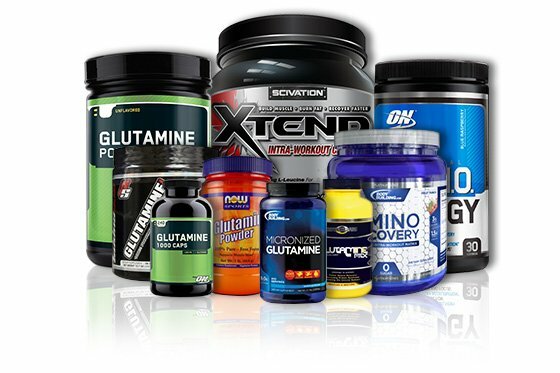 Glutamine is created in the human body when the non-essential amino acid glutamate (or glutamic acid) is broken down and binds with nitrogen-containing ammonia molecules. Think of glutamine as a kind of nitrogen sponge. It mops up ammonia and shuttles nitrogen between tissues, where it can be used for cell growth and tissue repair, among many other functions. It's been reported that some 30-35 percent of all nitrogen derived from protein breakdown is transported in the form of glutamine. Glutamine can also be broken down to re-synthesize glutamate, which makes glutamine a critical source of ammonia and nitrogen. Approximately 70 percent of your body's internal glutamine is produced in skeletal muscle, from where it travels to the small intestine, kidneys, and white blood cells. These are the dominant sites of glutamine usage. Internal levels of this amino acid depend on various factors. Pregnancy and lactation significantly deplete the body's glutamine stores, as do exhaustive exercise, illness, disease, starvation or fasting, rapid growth and development, and other conditions of extreme physiological stress. These are some of the conditions where increasing your glutamine intake or considering supplementation is appropriate. Glutamine—like other alpha-amino acids—is involved in regulating protein synthesis and breakdown. However, there's far more to it than that. Glutamine significantly affects BCAA metabolism, gut barrier maintenance, normal immune function, glucose formation, water transport, neurotransmission, and more. Your kidneys are a primary consumer of glutamine use that's where the ammonia cleaved from glutamine works to maintain your body's acid-base balance. Anywhere you find ammonia, you'll find glutamine. As metabolic acidosis increases—as in response to intense training or a high-protein diet—renal uptake of glutamine soars. In fact, one study found that just four days of a high-protein, high-fat diet, was enough to cause a 25 percent drop in glutamine levels in the plasma and muscle tissue. If all of these competing uses begin to outpace your body's ability to produce glutamine, then you may start to show signs of deficiency, including muscle wasting, depleted energy, and increased susceptibility to infections. Despite glutamine's various functions, little evidence suggests it will directly result in increased muscle mass, reduced body fat, or gains in muscle strength or power in normal, healthy people. However, given how stressful intense training is on the human body, athletes may see certain benefits from supplementing with significant levels of glutamine, or from stacking it with other supplements. One study found that when athletes suffered from mild dehydration, supplemental glutamine increased exercise performance and enhanced fluid and electrolyte uptake when combined with a glucose and electrolyte beverage. Supplementation has also been shown to raise levels of growth hormone in response to cycling to exhaustion. Extracellular concentrations of glutamine have also been shown to activate the signaling pathway mTOR, which is known to be responsible for increasing muscle size. However, here again, the benefits of glutamine supplementation required that other conditions be met: in this case, mTOR signaling appeared to require the presence of BCAAs (leucine, most importantly), as well as some threshold level of cellular hydration. In another case, collegiate track and field athletes who consumed four grams of glutamine per day for eight weeks, along with a loading and maintenance dose of creatine, saw greater gains in lean body mass than those who used creatine alone. This may sound significant, but it's hard to draw conclusions over a mere eight weeks at such a low dosage. Whether higher doses or a longer study would have resulted in significant differences is anyone's guess. What Are the Differences Between Types of Glutamine? Other than your stack, the most important thing to consider when selecting a glutamine product is the delivery system. If you're purchasing a powder, capsule or tablet, then free form L-glutamine works best. However, because glutamine is unstable, avoid ready-to-drink beverages or protein bars claiming to contain supplemental L-glutamine. If you favor RTDs and bars, look for the peptide-bound forms of glutamine, such as L-alanyl-L-glutamine, glycyl-L-glutamine hydrate, or an ingredient listed as "glutamine peptide." Just remember that the glutamine concentration of one of these peptide forms is typically approximately 65-70 percent. In other words, there's only about 6.5-7g of glutamine per 10g of glutamine peptide. Dose accordingly. Regardless of the form, up to 90 percent of ingested glutamine is eliminated during first pass. A mere fraction of the glutamine you consume will make it beyond your liver. The majority of the glutamine you consume being eliminated by the digestive enterocytes and immune cells within your gut. It's best to avoid products that contain n-acetyl-l-glutamine (not to be confused with N-acetyl glucosamine) or alpha-ketoisocaproyl-glutamine (also known as aKIC-glutamine). Both the acylated and aKIC forms may be stable, but the existing evidence suggests that they're both poor delivery forms for glutamine. What Should I Use It With? Consider stacking glutamine with sodium and other electrolytes first and foremost. Glutamine transport occurs via a sodium-dependent mechanism, and it has been shown to significantly increase cell volume, electrolyte absorption, and hydration. This might be helpful for both endurance and physique athletes, the latter because cell water volume is one of the many aspects of muscle hypertrophy. Significant decreases in cell water volume can also inhibit mTor signaling, which is crucial to building muscle. BCAAs: There are two main reasons why combining BCAAs and glutamine may promote greater gains in muscle mass and performance. First, ammonia concentrations, and therefore glutamine, directly affects BCAA metabolism. And second, mTOR signaling from extracellular glutamine first requires the uptake of BCAAs, primarily leucine. BCAAs plus glutamine might promote performance and muscle gains. Citrulline: Glutamine functions as a precursor for arginine and NO synthesis by transporting citrulline between tissues. Using glutamine with citrulline might boost citrulline's ability to stimulate the production of nitric oxide, which might lead to better oxygen delivery and nutrient transport to skeletal muscle. More nutrients to the muscle might translate to better recovery and growth. That may sound somewhat indirect, but then again, a messenger substance like glutamine has its hand in a lot of processes. Alpha-Ketoglutarate: Like glutamine, aKG serves as a precursor to glutamate and has been shown to dose-dependently spare glutamine degradation and increase mTOR signaling pathways, as well as glutathione. This means that glutamine, taken with aKG, might boost the potential for muscle growth and the production of glutathione, a powerful antioxidant. Glucose or N-Acetylglucosamine: Glucose deprivation reduces glutamine uptake and negatively affects cell growth and survival. If you're on a low-carb diet, it appears that the glycoprotein N-acetylglucosamine (NAG), which is available in supplement form, might be able to restore glutamine uptake and metabolism, potentially boosting recovery and cell function. It appears that the daily intake of supplemental glutamine needs to be high—at least 20-30g per day, consumed frequently—in order to raise plasma glutamine concentrations. To provide some perspective, consider that critically ill patients usually receive a constant intravenous infusion of between 20-30 g of glutamine per day. However, the bioavailability of infused glutamine they receive is 100 percent. It's no more than 30 percent from orally consumed glutamine. Thus, I recommend up to 30g of glutamine per day in divided doses throughout the day, preferably with meals or snacks containing carbohydrates to support glucose utilization. On training days, I recommend you consume glutamine prior to or during exercise to support hydration, electrolyte transport, and BCAA metabolism. You could take 10g before, during, and after your workout, or you could reduce those dosages to 5g if you also dose in the hours leading up to or following exercise. On non-training days, consume at least 5g of glutamine at frequent intervals, at least every 2-3 hours, to sustain an increase in plasma glutamine concentrations. There appears to be no need to cycle glutamine. In fact, there's more evidence to support the need for chronic ingestion of glutamine during periods of extreme physiological stress. There's a considerable amount of data supporting the lack of adverse reactions to glutamine doses as high as 30g per day. A recent 13-week toxicity study concluded that the "no-observed adverse effect level" (NOAEL) for L-glutamine occurred at the highest daily dose provided to male and female rats. In a human, this dose equates to roughly 0.308 g of glutamine per pound of body mass per day. For a 170-pound adult, that's a little more than 52g of glutamine per day. Again, this dose was shown to result in an extremely high level of safety with no documented adverse effects. Yes, glutamine is a key player in a whole host of functions that dramatically impact your ability to achieve your overall health and fitness goals. However, if you're depending solely upon glutamine or aren't using enough, you may be disappointed. Maximizing glutamine's effects on your body requires you to use your head first. If you're not training hard, your body probably can supply you all you need. But if you're the type who punishes your body regularly, taking it in the right way could help you keep performing at an elite level.